A decade ago no one dreamed that two abandoned cottonseed silos would become the icon of a burgeoning retail empire—yet that is exactly what happened. After the Brazos Valley Cotton Oil Mill closed in 1958 and the silos ceased to serve as storage in the 1990s, they became little more than a challenge for trespassing youth to climb for over a decade. Though some students still bemoan the fact that they missed their chance to scale the old rusty edifices, the Waco community has undoubtedly benefited from the newfound fame of Magnolia Market at the Silos. 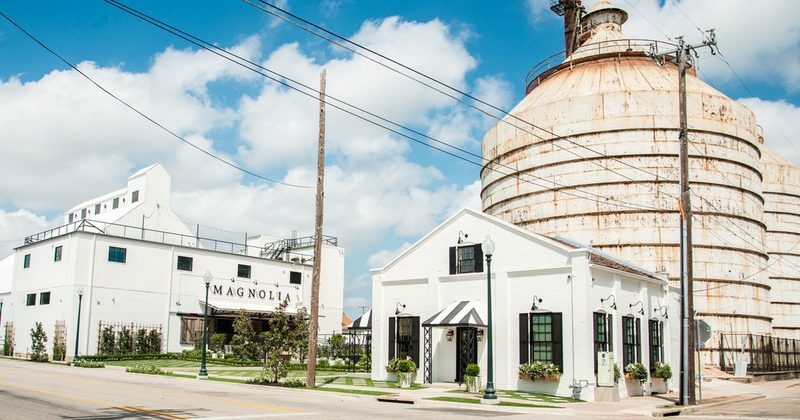 Just like any booming business, Chip and Joanna Gaines’ Magnolia Market blossomed from humbler roots. The retail giant began in Spice Village, a local Waco shopping spot that houses over sixty boutique stalls under one roof in downtown. But Joanna Gaines quickly needed more room to develop her brand, so she and Chip bought the “Little Shop on Bosque” in 2003 that served as their first stand-alone retail store. The shop also happened to be one of their first “fixer-upper” projects, as they transformed the small, rundown building into an attractive home décor destination. But the Little Shop on Bosque was only the beginning. In 2013 the couple took on a whole new challenge: television. Chip and Joanna took their Magnolia Homes brand and brought it to HGTV—a popular home improvement network. On the show, the Gaines bought run-down homes in the Waco area and turned them into manifestations of Joanna’s farmhouse chic style. The new TV show, Fixer Upper, exploded in popularity, turning more attention than ever on Waco and their small retail shop. With Fixer Upper came worldwide acclaim, and with worldwide acclaim came tourists. Thrust into the modern tourism scene, Waco had some catching up to do, and so did the Gaines. Within a year, Chip and Joanna procured what would become the symbol of the brand, the Silos, and surrounding real estate. True to the nature of the TV show, these old silos needed immense renovation and the Joanna Gaines touch before they could welcome visitors. 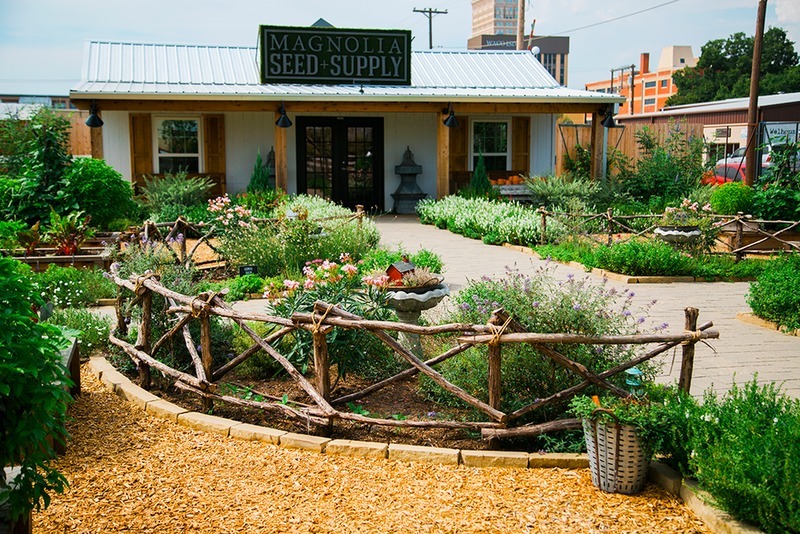 The Gaines quickly turned the neighboring building into the retail store, built a stage in front of the silos and a small building for the Magnolia Seed & Supply Garden Store, and drew up plans to convert the other adjacent building into a bakery. After turning these buildings around, in addition to copious landscaping and gathering of food trucks, the Silos were ready to go. Even with the launch of the store and food truck park in 2015, it was not until the Silos Baking Company moved into the last empty building in June 2016 that the Silos felt complete. Joanna had spent a great deal of time crafting recipes for her baked goods, and they were ready to be enjoyed by locals and tourists alike. Already known for its crowds, the Silos now also had a bakery line stretching around the corner each day. 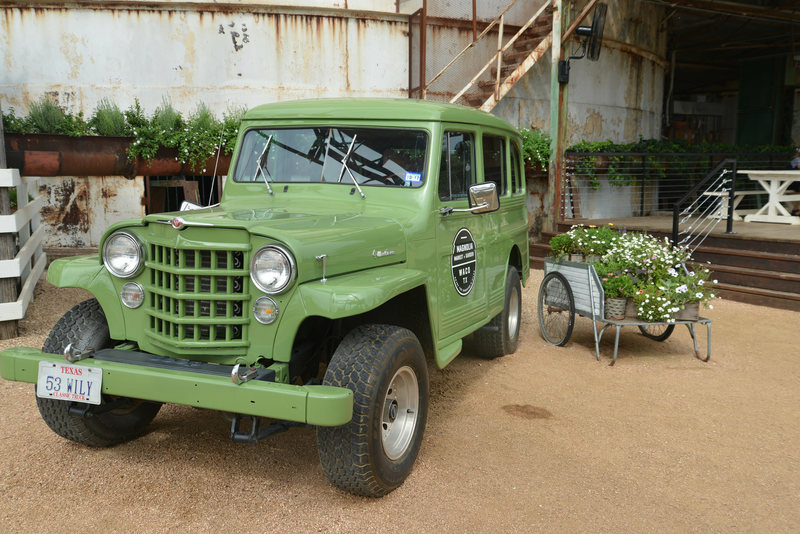 In all, the Gaines not only transformed an old Waco landmark, they helped transform the city, as evidenced by a growing downtown, expanded restaurant scene, and even tour buses seen around town daily. Though Fixer Upper stopped filming in 2018, the droves of tourists have yet to abate. But with a new Magnolia line at Target and a construction company that continues on without the cameras, the Gaines are not really slowing down. 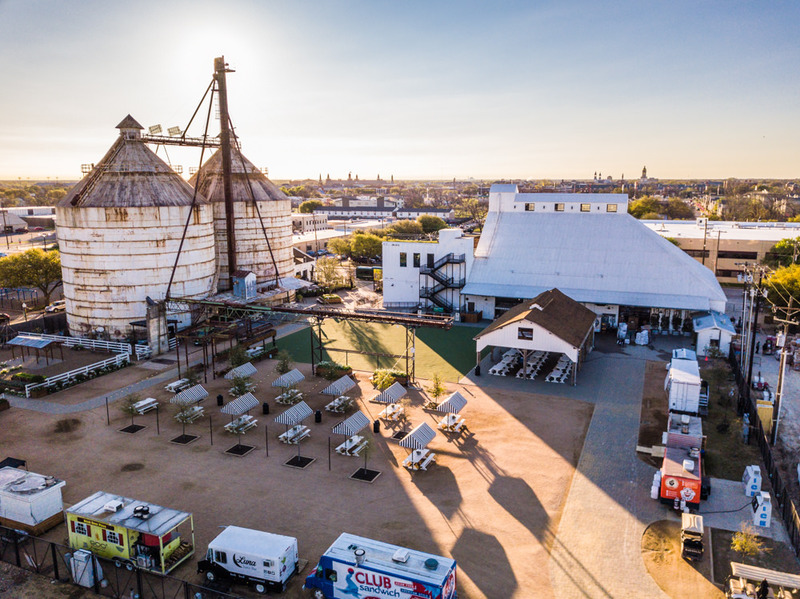 Whether it is for the home décor, the food trucks, or the cupcakes, during their time in Waco thousands of travelers go and rest in the shade of the Silos and soak up the atmosphere the Gaines crafted. 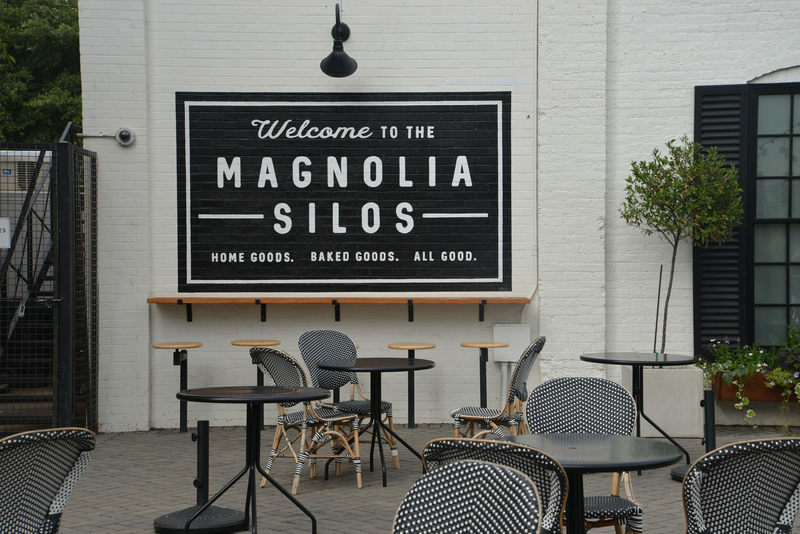 It is no overstatement to say Magnolia Market at the Silos is and will continue to be an important addition to Waco history. The Calm Before the Storm: This image shows the complex before the bakery was completed, which opened in the small white building on the right. 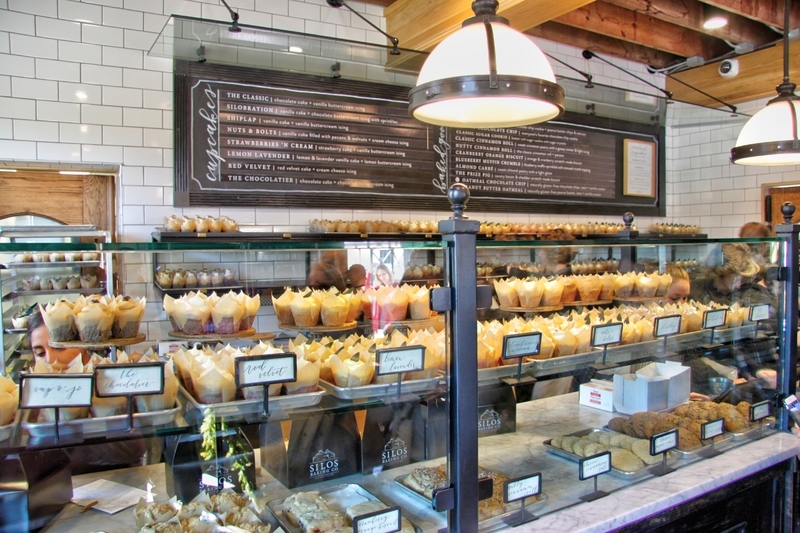 Named Silos Baking Co., it serves up delicious sweet and savory concoctions. ~ Source: “Magnolia Market at the Silos.” Magnolia Inc. , magnolia.com/silos/. 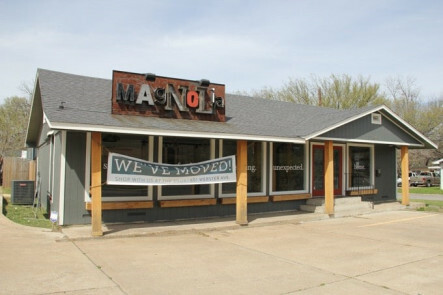 The First Magnolia: The original Magnolia Market “Little Shop on Bosque” where Chip and Joanna really started to gain traction in their business. The small shop reopened in 2018 on weekends only and sells slightly damaged and discontinued Magnolia goods. ~ Source: “The Original Magnolia Opened in 2003.” Home &amp; Hera, 15 Jan. 2018, homeandhera.com/2018/01/15/visiting-magnolia-market/. View from the Sky: An aerial view of the Silos shows the whole layout. Picnic tables line the open space for visitors to enjoy their food truck meals, and all within view of the Silos stage for performances. A rendezvous inside the retail store can provide some shelter from the Texas weather, and the bakery on the other side of the Silos fuels tourists daily. ~ Source: Chen, Thomas L. “Quick Day Trip to Check out the Silos in Waco.” Flickr, 20 Mar. 2018, www.flickr.com/photos/thomas350/40252073954/in/photolist-24jWpe5-TzQxfi-HYnVBP-27TgTZo-21JcZCo-ZW3zpJ-ZU4nfN-HYnX4X-G39cUc-SaijLo-XDW1PB-CDAJV2-25M8XQs-4s7vBE-XarDK7-CSFUHY-HYo1wi-ZW3yUq-HVkHpL-26uv3gd-ZU44fE-TBVBuy-XKYrkK-QMrotj-H3B2cH-7NG2qC-YU6gTh-GSy9GK-FyYqCw-8KsoJ-YU64YA-274c6vN-JZ9Qpx-21JbRij-F47zPe-ZYLSt6-JZdrKg-ZW3yMS-eB9RtL-215MPjY-21JbMEY-EWvjKG-rppztf-29NZxzB-CDALZc-QqSmrs-29eks32-RHnQN6-RBmEUT-QtCYQi. 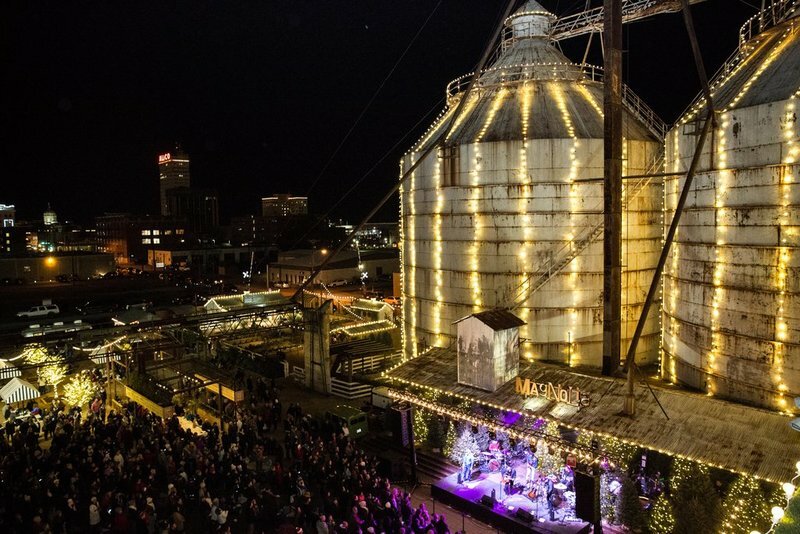 The Stage is Set: The Gaines host events often at the Silos, one of the biggest being the annual Silobration in October. 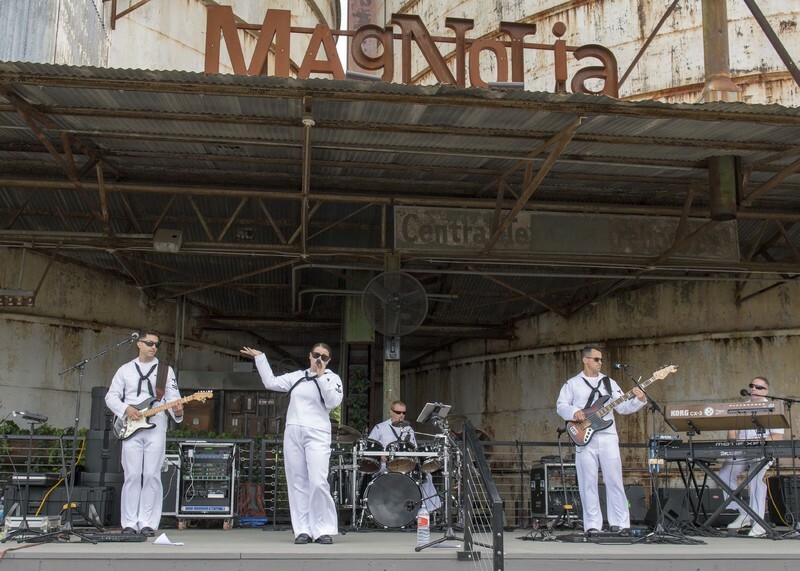 On top of the usual offerings, Silobration includes various vendor fairs and concerts by big-name artists who play on the stage under the Magnolia sign. ~ Source: Kathy. “The Famous Silos.” Flickr, 3 Aug. 2017, www.flickr.com/photos/[email protected]/37382256901/in/photolist-YXkQAH-21ySiHJ-CSFSD7-G399Gk-VdDwMH-NVVHW3-VpKawZ-qDCczL-UjDsLG-HVkKzN-HVkFVJ-VZmG8j-GQFa9Z-H3AZpK-EBtit7-6q4KkF-G396Xn-27EzoCF-EkeNeY-284ZYxN-HPEk5u-H3B594-ZW3D2J-TDbA5B-H3B3W4-VqgzWK-G39dkT-24jWpe5-TzQxfi-HYnVBP-27TgTZo-21JcZCo-ZW3zpJ-ZU4nfN-HYnX4X-G39cUc-SaijLo-XDW1PB-CDAJV2-25M8XQs-4s7vBE-XarDK7-CSFUHY-HYo1wi-ZW3yUq-HVkHpL-26uv3gd-ZU44fE-TBVBuy-XKYrkK. 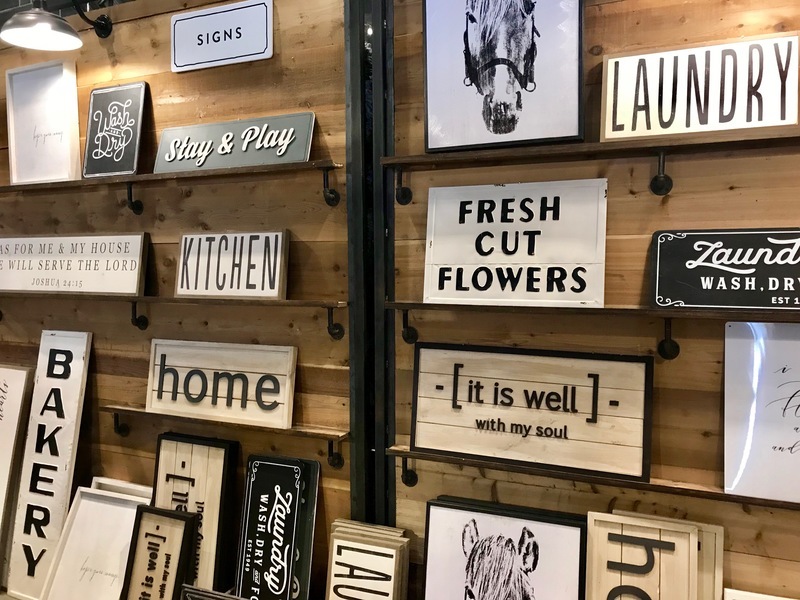 Signs and Shiplap: One of the staples of Joanna’s farmhouse chic style is her wall décor and wood signage that can always be found at Magnolia Market, and in participating Target stores as well. ~ Source: Daveynin. “All About the Quotes at Magnolia.” Flickr, 5 Oct. 2017, www.flickr.com/photos/daveynin/37820321776/in/photolist-ZC432o-HYnV8c-21Lkx6d-21JcpgN-HVkDYN-PatdsA-29ejYd4-MEevPk-Mu9Xq7-25QFBgG-MEevAz-MBdmC5-LGMQuh-21JcEQ3-27RFzv3-MEeuxT-Nu4tQW-LGRbfH-Mua275-MBdmGJ-2axaEcy-MBdmMU-MEeuDK-MEetVR-29w7Ebo-MBdmL1-LGMTn1-MBdi7s-MEeu72-MEeuQM-MEetZZ-29ejeDg-MBdish-ZW3ygG-MEeuHH-MdhopW-Mua6Pw-LGRaFM-MEeuki-DFp64E-LGMTgE-Mua69y-LGMTjW-MEeusT-LGR878-LGRaSZ-LGR51i-Mua5mb-2axbMKY-2aBt4LP. 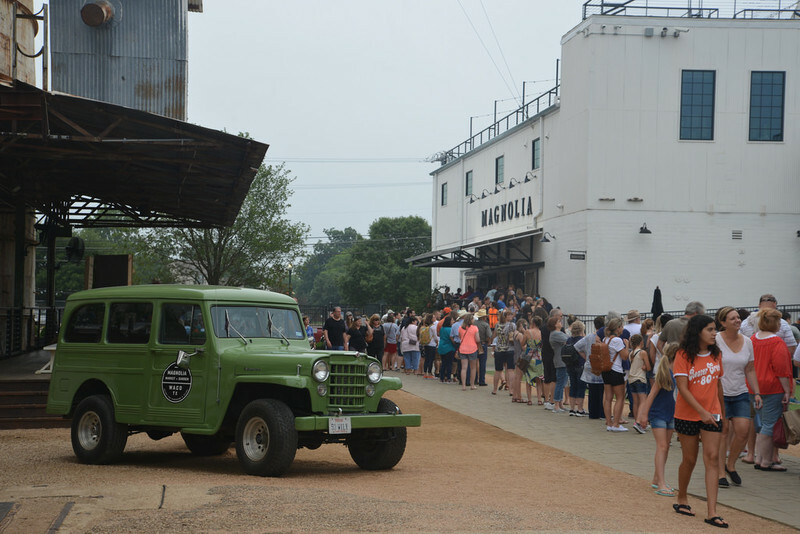 Long Lines: The line outside both the store and bakery are often impressive, and many tourists are willing to brave the Texas heat to eat a Silos cupcake and buy the latest Magnolia trends. ~ Source: ChunkyHemi. “Texas Triangle 2017.” Flickr, 26 May 2017, https://www.flickr.com/photos/_riczen_/36456142615/in/album-72157684926722230/. Navy Outreach Event: The Silos also host benefits for other organizations. Here the Navy Outreach is performing a concert to raise money and support. ~ Source: Navy Outreach. “180406-N-YR245-0132.” Flickr, 6 Apr. 2018, www.flickr.com/photos/navyoutreach/41245039442/in/photolist-25QFBgG-MEevAz-MBdmC5-LGMQuh-21JcEQ3-27RFzv3-MEeuxT-Nu4tQW-LGRbfH-Mua275-MBdmGJ-2axaEcy-MBdmMU-MEeuDK-MEetVR-29w7Ebo-MBdmL1-LGMTn1-MBdi7s-MEeu72-MEeuQM-MEetZZ-29ejeDg-MBdish-ZW3ygG-MEeuHH-MdhopW-Mua6Pw-LGRaFM-MEeuki-DFp64E-LGMTgE-Mua69y-LGMTjW-MEeusT-LGR878-LGRaSZ-LGR51i-Mua5mb-2axbMKY-2aBt4LP-Nu4cuQ-JMbQfH-Mu9Xto-HxVRvJ-LGMRCQ-WgGgXd-26zbCHn-2aBtH1i-LRAq7v. '53 Wily: Magnolia’s famous classic 1953 Willys is a popular photo spot for tourists and locals. The Gaines can fix up old cars just like they can old homes. ~ Source: ChunkyHemi. “Texas Triangle 2017.” Flickr, 26 May 2017, www.flickr.com/photos/_riczen_/35620871054/in/album-72157684926722230/. Garden Haven: The Seed and Supply store, nestled in a garden on the Silos property, offers gardening tools and seeds for cultivation. Greenery is often a staple of Joanna’s artistic vision. ~ Source: Pinckney, Lizzy. Magnolia Seed and Supply. httpwww.lizzypinckney.comblog2017212texas-september. 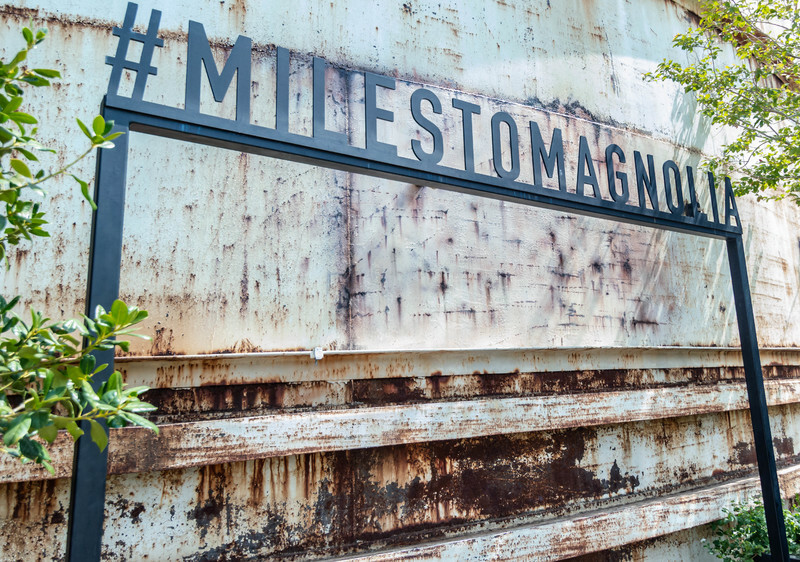 Snap a Picture: #milestomagnolia really says it all, as tourists travel from around the world to visit the Silos complex. This not only brought good fortune to the Gaines, but to Waco as a whole, whose economy has grown with the influx of visitors. 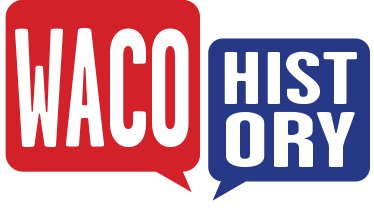 Brand new tour companies, such as Waco Tours, have also capitalized on this opportunity and bus people around town to see all the other sites Waco has to offer, such as the Mammoth National Park, Cameron Park, Branch Davidian compound, Dr Pepper Museum, and Baylor University. ~ Source: Zanone, Jon. “The Silos, Waco, Texas.” Flickr, 30 July 2018, www.flickr.com/photos/[email protected]/42042947420/in/photolist-274c6vN-JZ9Qpx-21JbRij-F47zPe-ZYLSt6-JZdrKg-ZW3yMS-eB9RtL-215MPjY-21JbMEY-EWvjKG-rppztf-29NZxzB-CDALZc-QqSmrs-29eks32-RHnQN6-RBmEUT-QtCYQi-RDPbKf-28rap7D-W9sngQ-ZC437y-GSyWWP-CdoLFP-BPnYdb-CSFWRA-QtD6yi-RHo56i-RJxLcC-25SyfEf-HYnYV2-UbB1bD-HXGFSb-27WH9n4-25XAeFC-DFp8Lo-XmktnJ-29w5bR7-2aD7cYR-Xmkst9-YiUzYy-MFpDQY-ZsJSsx-25bX88w-HxVT7j-KVEH3a-21JcNg5-29w5pNE-29ehHXe. Selfie Spot! : The bakery offers a quaint seating area outside, along with a popular photo spot. The Gaines ended their TV show to focus on their family and raising their five children, but that has not stopped the fierce love tourists have for the Silos and the bakery. ~ Source: ChunkyHemi. “Texas Triangle 2017.” Flickr, 26 May 2017, https://www.flickr.com/photos/_riczen_/36318912951/in/album-72157684926722230/. Fresh Cupcakes: The cupcakes really speak for themselves, a classic favorite being the lemon-lavender. Other flavors include “shiplap,” “nuts and bolts,” and other construction-related names. The bakery also offers a “prize pig” biscuit chock-full of cheddar and bacon. ~ Source: Bond, Peter. 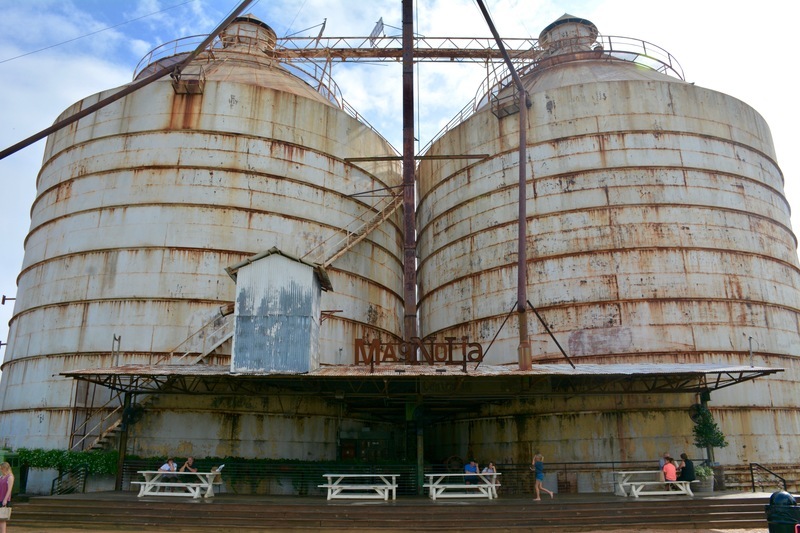 “Magnolia Market at the Silos.” Flickr, 22 Nov. 2017, www.flickr.com/photos/pvsbond/38546122426/in/album-72157688816927701/. Rockin' Around the Christmas Tree: Around the holidays, the Gaines string lights from the Silos and have Christmas concerts. It is never a dull moment, and the Silos bring cheer to attendees and passersby alike. ~ Source: “Silos Christmas Concert.” Magnolia Inc., httpsshop.magnolia.comproductschristmas-at-the-silos-concert. Anabel Burke, “Magnolia Market at the Silos,” Waco History, accessed April 19, 2019, https://wacohistory.org/items/show/188.